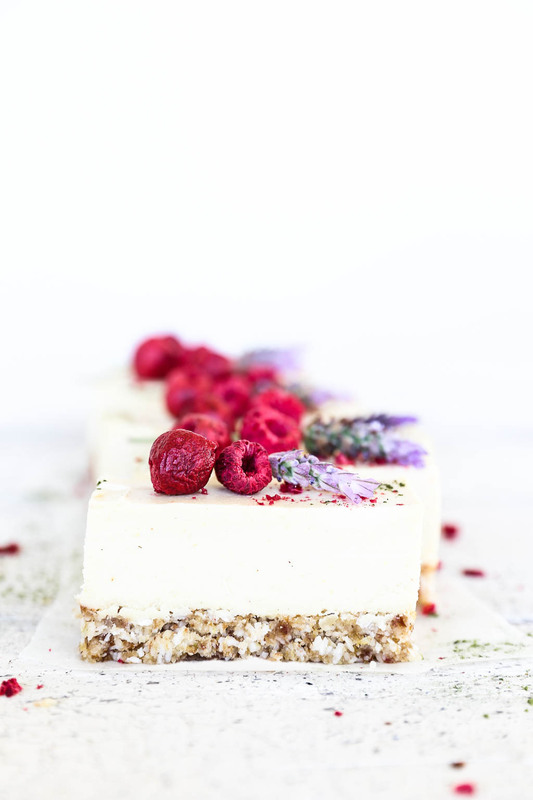 The inspiration for this zesty raw lemon & coconut cheesecake came from one of my favourite organic, raw food eatery’s called Greenleaf Organics. Their version was almost like a lemon custard slice. The lemon filling had an amazing consistency which (after failing to replicate it with my usual ingredients) must have been achieved with a gelling agent like Irish moss. Although my version doesn’t contain Irish moss or have quite have the same custard-like quality, it’s still beautiful in it’s own right. 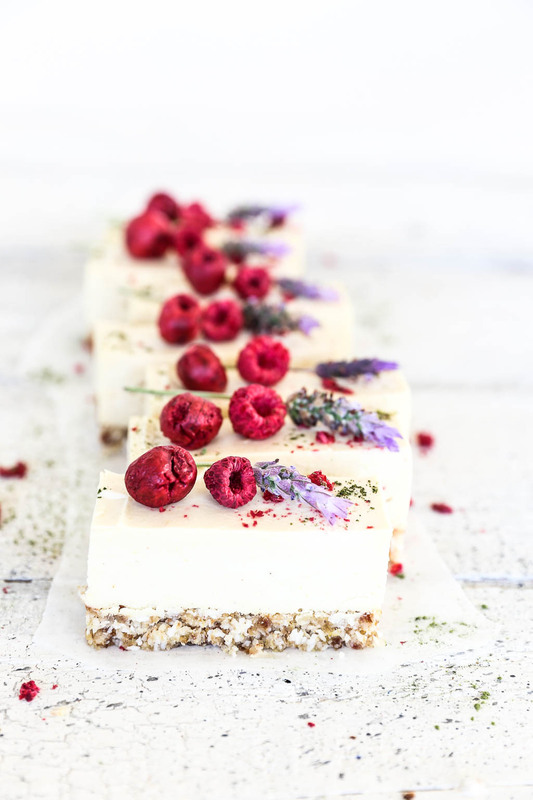 It has a very delicate, light texture, with a fresh lemon flavour, which is quite different to the usual heavier style raw “cheesecake”. The base is made from brazil nuts, coconut, medjool dates, coconut oil and lemon zest. Brazil nuts are the best dietary source of the selenium and are also a good source of magnesium. Selenium is an antioxidant and is important for tissue elasticity and preventing free radical damage to cells. It also boosts the body’s immune response against infections and cancer cells and plays an important role in thyroid function and fertility. Magnesium is essential for bone health and 300 or so biochemical reactions in the body, which essentially means magnesium is involved in the proper functioning of nearly all the systems in the body! Medjool dates act as a sweetener and binding agent in this cheesecake base. Dates are a whole food sweetener that contain beneficial amounts of the minerals zinc, iron, potassium, magnesium, phosphorus and calcium, they also contain vitamins B6 and A and soluble dietary fibre. The lemon coconut filling is made from soaked cashew nuts, coconut milk, lemons, cacao butter and coconut oil. There are a couple of important reasons for soaking the cashews. Firstly, it makes them much easier to blend and creates a lovely creamy result and secondly, soaking removes the natural enzyme inhibitors which allows the cashews to be digested much more easily by the body. Coconut oil is a great source of lauric acid which has anti-bacterial, anti-fungal, anti-viral and anti-inflammatory properties. It boosts your immune system and metabolism, lowers blood pressure and helps with the absorption of minerals. Even though coconut oil is a saturated fat, it’s considered a ‘heathier’ fat because lauric acid is a medium chain fatty acid. This means it’s easily digestible and processed by your body in the same way as carbohydrates as a direct source of energy. And lastly raw cacao butter is the pure cold pressed oil of the cocoa bean and is very high in antioxidants. Antioxidants are so beneficial because they reduce the inflammatory action of free radicals, which helps prevent disease and slows the ageing process. So as you can see this raw dessert is full of nutritional value, and because it’s also high in protein you’ll only need a small serving to satisfy. I hope you love this recipe and if you post any pictures to social media I would love to see them! Tag @swoon.food #swoonfood so I can find them. Enjoy! What’s your favourite raw “cheesecake” flavour? Leave me a comment down below, I’d love to hear from you! Start by soaking the cashew nuts, place them in a bowl, cover with filtered water and leave to stand for 4 hours. Drain off the water and rinse the cashews well. Line a 10cm x 25cm loaf tin (or tin of your choice) with a double layer of cling film and set aside. To make the base, gently melt the coconut oil by placing it in a heatproof bowl over a pan of steaming water with the heat turned off (see notes below). Place the desiccated coconut, brazil nuts and salt into a food processor and blend until the mixture looks like chunky crumbs. Add the medjool dates (ensuring you have removed the pitts!) and blend until well combined. Add the lemon zest now if you are using. Lastly add the melted coconut oil while the motor is running. Press the base mixture evenly into the prepared tin, then place in the fridge to set. To make the lemon coconut filling, first gently melt the coconut oil and cacao butter by placing it in a heatproof bowl over a pan of steaming water with the heat turned off (see notes below). Place the soaked and drained cashews into a high speed blender (e.g. Vitamix/Blendtec) along with the lemon juice, zest (if using), coconut milk, pure maple syrup and sea salt, and blend until smooth. Add the melted coconut oil and cacao butter gradually through the top of the blender while the motor is running. These should blend in completely and you should end up with a smooth lemon cream. Pour the lemon coconut filling onto the prepared base, smooth with a spatula and place in the freezer to set for a minimum of 1 hour. Transfer the lemon coconut cheesecake to the fridge a few hours before you want to serve it. To serve lift the cheesecake out of the tin using the cling film, place on a chopping board and peel back the cling film. 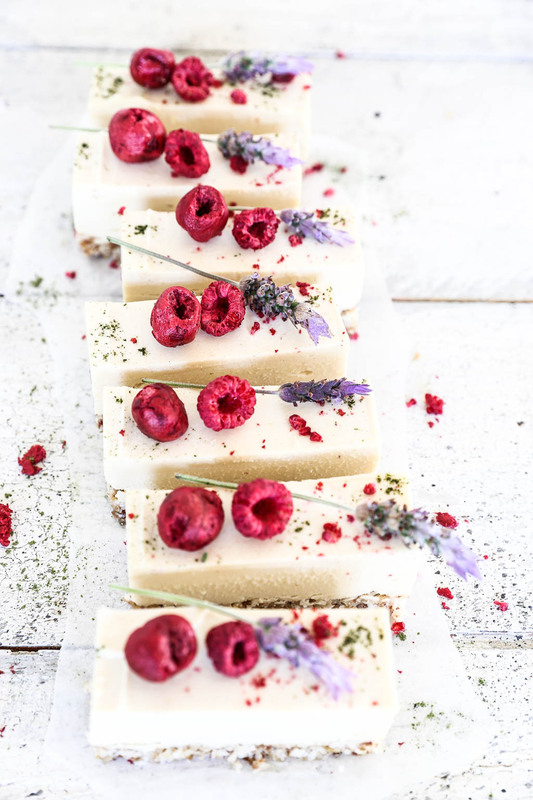 Cut into slices, place on serving plates and decorate with freeze dried berries of your choice. Once defrosted the raw cheesecake will keep covered in the fridge for up to 5 days. Note on activating nuts: activating is the process of soaking nuts (or seeds) in water to remove the natural inhibitor enzymes on their skins to make them more digestible. The cashews in this cheesecake filling are therefore activated. If you also wanted to activate the nuts in the base for this recipe they would need to be soaked and then dried. Ideally this would be in a dehydrator at 46ºC for 1 1/2 – 2 days, or in an oven on the lowest fan bake setting with the door ajar for about a day. The aim is to keep the nuts below 46ºC so the nutrients remain unaffected by heat and the food still deemed raw. However high fat nuts like brazil and macadamia nuts don’t show any significant nutritional benefits from this intensive process, so there are no real advantages in activating these. Note on melting raw ingredients: to ensure ingredients remain in their raw form and their nutrients fully intact, they must not be heated above 46ºC. When melting raw coconut oil or raw cacao butter, do so by placing the bowl of ingredients over a pot of steaming water with the heat turned off. This should ensure the ingredients do not heat above 46ºC. Note on choosing maple syrup: make sure you get the real deal. There are quite a few maple syrups out there that are just maple flavoured sugar syrup, full of additives and often high fructose corn syrup. Pure maple syrup lists only “pure maple syrup” under ingredients and is harvested from maple trees by extracting the sap, evaporating off excess water and filtering to remove impurities. Pure maple syrup is an unrefined sugar and has a lower glycemic index than refined sugar. It contains natural phenols which acts antioxidants as well as small amounts of the minerals calcium, potassium, iron, manganese and zinc, unlike refined sugar which is literally empty calories. Pure maple syrup is still a form of sugar however, so while it is better choice than refined sugar it is still best used in moderation. Feel free to use less in this recipe if it suits your tastes and if you do decrease the amount of maple syrup, replace the quantity you leave out with an equal amount of coconut milk. Note on raw honey: raw or unprocessed honey is a wholefood sweetener that has a higher fructose content than pure maple syrup but it also contains more antioxidants and has antibacterial and antifungal properties too. Raw or unprocessed honey can usually be found at farmers markets and specialty food stores. Most of New Zealand’s Manuka honey is also minimally processed and contains much of it’s inherent nutrients and protective properties. Beware of liquid honey’s, especially the types in squeezy bottles as these have been refined and often don’t contain any beneficial properties. Could I use a ninja blender to mix things? How does adding cacao nor alter the colour? I’ve made this twice so far. Once just to try it out (and it was fantastic), and the second time was to serve it for a dinner party. Everyone loved it! I not only received wonderful feedback on the taste, but also the presentation. I will definitely be making it again. I stumbled across your site while looking for a raw vegan cheesecake. After having such good success, I am browsing thru your other recipes for the next dinner party. Thanks so much! WoW beautiful recipe! I’m trying to get closer to this type of kitchen and your recipes are very detailed. I have made this lemon cheesecake four times. It is loved by everyone. The nutty base is perfect and the cheesecake part is smooth and creamy and very lemony. I found I had to use my blender to get the cheesecake as smooth as I wanted it. Food processor perfect for base. Could be used for cheesecake part but wont be as smooth textured. Wonderful recipe and I will be looking for more. Many thanks. Hi I’m Leslie Storms @lesliestorms – I follow you on Instagram and I recently launched a website: annagraceGoods.com all about wellness and conscious living. I fell in love with all the magic you create – awhile back! I would love to feature one of your recipes (if you are interested) – It would be your post completely and link back to your site. Please let me know your thoughts. I appreciate your consideration. Hi. Can I substitute or ommit the cacao butter? I made this incredible cheesecake this week, my first attempt at a vegan dessert recipe and I was absolutely BLOWN away by the taste. The light, creamy filling was one of the best cheesecakes I’ve ever had, especially as the texture is perfect for cheesecake but not heavy like most of them. I left the rind out of the filling but the amount in the base was the perfect hit and I was pleasantly surprised that there was not an overpowering flavour of coconut!! I’ll be using this recipe again and again, thank you !! I have now made a version of this recipe twice! I love the zingy taste and texture. Hey Sibel, that’s brilliant! It’s such a winner isn’t it. 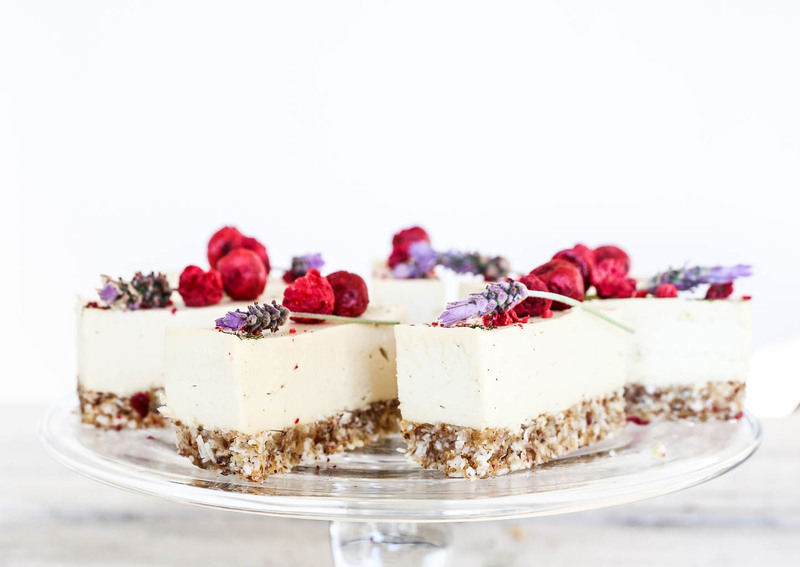 Still my favourite raw “cheesecake” recipe 😉 So pleased you enjoy it too.